At least 35 people have been killed in a suicide car bomb attack in a busy square in Iraq's capital, Baghdad, security and medical sources say. Sixty-one other people were injured by the blast in the predominantly Shia Muslim eastern district of Sadr City. Another car bomb later exploded in the car park of the nearby Al-Kindi hospital, killing three people. The jihadist group Islamic State said it carried out both attacks, targeting a "gathering of Shia" in the first. 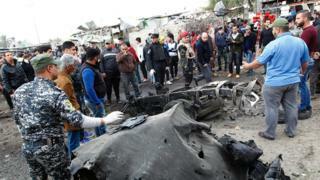 On Saturday, IS said it was behind two suicide bombings at a market in Baghdad that left 28 people dead. Again, the reported targets were Shia, whom it regards as apostates. Monday's first attack targeted a square in Sadr city where day labourers typically wait to pick up work. Asaad Hashim, an owner of a mobile phone shop who suffered shrapnel wounds to his right hand, told the Associated Press that the bomber had pretended to be a man seeking to hire labourers. The labourers crowded round the vehicle, trying to get hired. "Then a big boom came, sending them up into the air," Mr Hashim said. Nine of the victims were women in a minibus that was passing through the square at the time, according to the Reuters news agency. Three policemen stationed at a local checkpoint were also among those killed. Mr Hashim blamed "the most ineffective security forces in the world" for failing to prevent the attack. Vegetable stall holder Ali Abbas said: "We have no idea who will kill at any moment and who's supposed to protect us." All of the victims of the attack outside the Al-Kindi Teaching Hospital, just to the south, were civilians, sources told the BBC. "The terrorists will attempt to attack civilians in order to make up for their losses, but we assure the Iraqi people and the world that we are able to end terrorism and shorten its life," Prime Minister Haider al-Abadi told reporters after meeting French President Francois Hollande in central Baghdad. Earlier, Mr Hollande visited the Iraqi Counter-Terrorism Service's academy near the capital and told French soldiers based there that fighting IS in Iraq was helping prevent terrorist attacks at home. He will later travel to the Kurdistan Region to meet troops advising pro-government forces taking part in the offensive to drive IS militants from the northern city of Mosul, their last major urban stronghold in the country. Since entering eastern Mosul at the start of November, Iraqi special forces and army units have found their advances hindered by waves of suicide bombings, as well as snipers, shellfire and bad weather. Despite that, Mr Hollande predicted that the city would fall within weeks. "Daesh is stepping back and Daesh will be defeated," he added, using a pejorative term for IS based on the acronym of a previous name in Arabic. "It's a year that will be a year of victory, here, against terrorism." Elsewhere in Iraq on Monday, IS militants attacked an army barracks near Baiji, about 180km (112 miles) north of Baghdad, killing four soldiers, security sources told the Reuters news agency. The militants seized weapons at the base and fired mortars at the nearby town of Shirqat, forcing the authorities to impose a curfew and close schools, officials said. Gunmen are also reported to have summarily killed nine pro-government Sunni tribal fighters at a village near Udhaim, 90km (56 miles) north of Baghdad.